Finding out you are insulin resistant doesn't mean much unless you understand what that implies, and how it effects your health. Insulin resistance is an condition in which the body is not responding properly to the hormone insulin. If faulty insulin signaling is not treated, it can develop into worsening conditions of metabolic syndrome, pre diabetes, and finally type 2 diabetes. What Causes the Insulin Resistant Condition? The insulin resistant condition is rooted in the metabolic effects of a high carb diet in combination with a lack of exercise. Weight gain is a symptom of insulin resistance, rather than a cause. Carbohydrates are foods which contain either some form of sugar or starch, or both. For instance, orange juice is full of fructose, a type of sugar, and white potatoes contain large amounts of starch. Both types of carbohydrate are broken down in the body into glucose, a simple sugar, which your cells can use for energy to do all the things that cells do. Since too much glucose in your body can be toxic, your pancreas releases a powerful hormone called insulin. Insulin works to control the amount of glucose in your bloodstream. It acts to quickly move glucose from your bloodstream and push it into your cells where it can be burned or stored. But there's a catch. 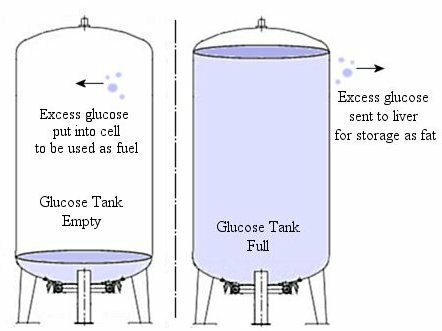 To get the glucose into the cells, the cell's glucose "storage tanks" have to be empty. This is logical when you think about it. Imagine what would happen if you tried to fill up your car's gas tank if it were already full. And just like running a car burns up gasoline, when a person exercises, the glucose which is already in the glucose tanks get used. Now there is room for insulin to push the glucose made from the last meal into the muscle cell for fuel. If a person exercises frequently, lots of carbohydrates can be eaten without impacting blood glucose levels very much. The carbs instead act as a quick source of fuel. This is why professional athletes, who may exercise for 6 hours a day, are coached to eat a lot of carbohydrates. For us regular folk who might sit at a desk 8 hours a day, any extra glucose which hasn't been utilized gets shunted off to the liver. The live transforms the extra sugar into particles which are stored as body fat. As you can now understand, when a person consumes a daily diet high in carbohydrates while avoiding exercise, excess glucose is created and because the storage tanks in the liver and muscle are already full, the new glucose has no place to go so it builds up in the bloodstream. In response, the body releases more and more insulin to try and push the glucose into the cells. Eventually, the liver, muscles and fat tissue are so stuffed, they can't take any more. They put up a big stop sign to insulin, and the glucose is left in the blood stream with no place to go. The person's baseline blood sugars go up, their blood sugars stay high even when no food is eaten, and eventually the person is diagnosed as insulin resistant, and down the road, with type 2 diabetes. Some doctors diagnose the patient with having metabolic syndrome. Either way, the risk of developing pre diabetes or Type 2 diabetes now increases dramatically. You can find out whether you have insulin resistance or prediabetes by checking out the symptoms on my pre diabetes symptoms list. If you have more than 3 or 4 of those symptoms, it might be time to make some dietary changes. And if you've been diagnosed as insulin resistant or as having metabolic syndrome, you can do something about it. Use what you learn on my ketogenic diet plan page to lower the amount of carbohydrate that you eat in each meal. In addition, add a weekly or daily exercise program to your life. Even a simple exercise like walking several times a week can help reduce insulin resistance. For quicker results, look into high intensity interval training. These changes really do work if you stick with them. 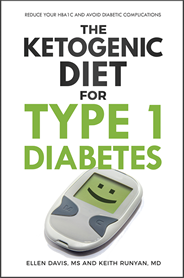 I and many of my readers and people I know have used a low carb, high fat diet to completely reverse not only insulin resistance and prediabetes, but the symptoms of Type 2 diabetes as well. I'm not saying you can reverse severe insulin resistance symptoms overnight. You have to have patience. It took years to develop metabolic health issues, and it may take years to reverse the damage. However, every change you make will help you feel better, and starting today is great step toward better health.